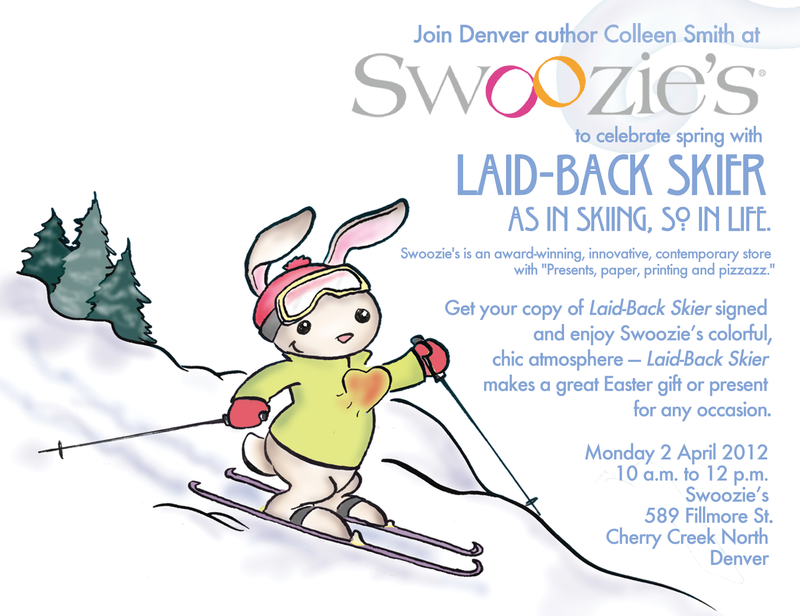 We’re thrilled to have the opportunity to meet some of you at Swoozie’s on Monday April 2, 2012 from 10 a.m. to 12 p.m. Come out to Swoozies’ newest location in Cherry Creek North in Denver to check out the store and get your copy of Laid-Back Skier signed! Of course, snow skiing inspired me, too. As I carved turns, I began crafting this new book’s text in my head. All the while, I envisioned a charming book in three-dimensions, with luscious eco-friendly paper pages and colorful illustrations between hard covers. I’m trained as a writer, and I’ve made my living as a writer. Consequently, books are an integral part of my life. They have been since I was a wee one. In fact, in my baby book, my mother noted that “book” was one of my first spoken words. My mom told me I always loved to be read to; and she related more than once that whenever she tried to skip pages – turning more than one at a time to rush through a reading – I always busted her. “Laid-Back Skier”is for people of all ages and not for skiers only. I hope mothers and other adults will read “Laid-Back Skier” to their children or grandchildren. I intend this book for “skiers, riders and snowflakes of all ages.” The vocabulary might include a few words kids won’t know, but the book will provide an opportunity to learn. Besides, they’ll be captivated by the playful pictures, anyway. For Friday Jones Publishing, Denver artist Patty Leidy did 38 original illustrations. “Laid-Back Skier” will delight adults, too. I hope this book reminds adults of the tactile pleasure of sitting with a book, turning pages, relishing full-color illustrations reflecting the text, reading. Yes, reading! An actual book! “Laid-Back Skier” is a quick and easy read with special features. If you’re like I am, reading is not as easy as it once was. We’ve created an ADD culture with head-spinning distractions bombarding us constantly. “Laid-Back Skier” takes that into consideration. Intentionally, I kept the text very simple with only one sentence per page in the body of the book. Just about anybody can read this book and recall the joyful accomplishment of reading a book cover to cover. To add to the practicality of the book, I added a skier’s journal and a skier’s packing list. “Laid-Back Skier” is my second brainchild brought into the world by Friday Jones Publishing, my independent publishing company. Last September, Friday Jones Publishing released my first novel, “Glass Halo.” While the books’ subject matter varies greatly, both books present artful design and attention to graphic details that make quality 3-D books worth preserving even in the 21st century. in honor of my late, beloved, 3-legged rescue best friend: Friday. and, in general, the joys of living. help take the bite out of life. allows for random posts, anecdotes, and stories from everyday life. our communities, and even our world. Friday Jones Publishing also advocates for books and reading. We’ve donated copies of our books far and wide to people or organizations in need. “Stuff My Yoga Teachers Say” ~ Reflections on yoga from a practitioner with nearly 20 years of practice in traditions including Iyengar, Bikram, and Baptiste Power yoga. “Treble Clef” ~ A lifelong music fan, I’ve published a number of features on major musicians. I’m a reporter for The Denver Post music blog, Reverb. Gardening ~ For the last 15 years, I’ve reported on gardens. Here’s a link to a gallery of “Laid-Back Skier” illustrations by Patty Leidy – see her self-portrait at left. Jesse gave me one of his sage young adult looks and said, “If you want to sell this book, you have to have a Facebook page,” he said. Jesse is wise, so I said “Okay.” But I left the Facebook page dormant for months. Until another Friday Jones Player, Josie, told me, “You really need to get into Facebook.” Josie is wise, too, but I dug in my heels. “Things will happen on Facebook that you would never expect,” Josie said. So I jumped into the Facebook vortex. And how! I post regularly now, and I enjoy Facebook, I admit. Jesse was right: Facebook helped sell my “Glass Halo.” My first novel reached readers I knew only through Facebook. 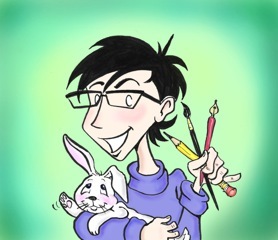 Moreoever, I met the illustrator for my second book – “Laid-Back Skier” – on Facebook. I’m not sure how Patty Leidy and I got connected, but I began noticing her “Cafe Neurotic” comics on Facebook. I loved Patty’s style and the fact that she is a fan of bacon and cupcakes. Her gags made me smile and sometimes even LOL. Mostly, I admired Patty’s artful drawing. Genius flows through the ink in her pen. When I figured out that Patty lived in Denver, as do I, I messaged her about the possibility of commissioning her to do some drawings for the ski book I envisioned. Yes, she was interested! At our first meeting, I explained my idea for “Laid-Back Skier.” She showed me her sketchbooks: Moleskin books filled with doodles and drawings in a wide range of styles. Patty and I began meeting at the coffee court outside Nordstrom in Cherry Creek North.We worked through some initial drawings, but Patty’s first sketches of people–tho’ expertly rendered–were not matching the playful spirit of what I had in mind for “Laid-Back Skier’s” messages that apply to everybody’s ups and downs. One day, on the first of the month, I posted on Facebook one word “Rabbit.” Saying “rabbit” on the first of the month is a common British superstition to bring good luck. “Ski bunnies!” I realized, would be perfect. Patty hopped to and drew some initial bunnies to set the style. I knew we were on to something better than the humans. 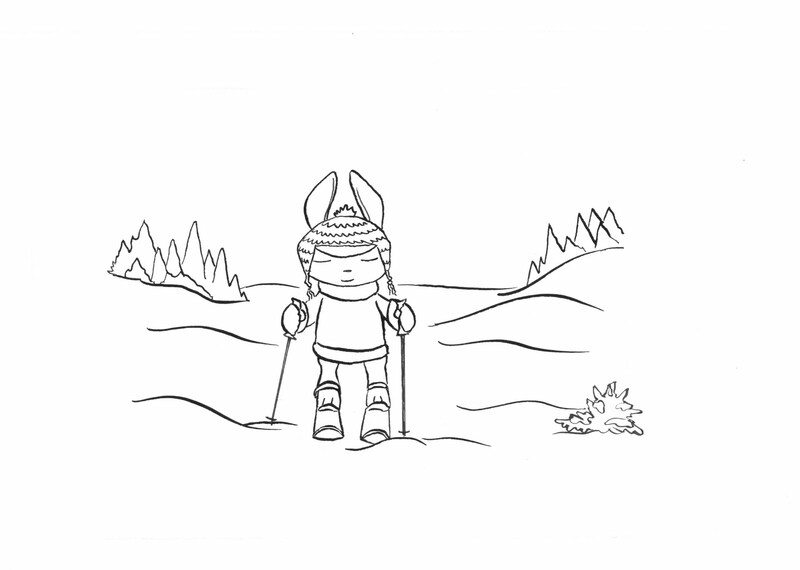 We met several times to collaborate on the bunnies, their fur color and eye color, their attire, equipment, actions, and the general gist of alpine landscapes. We created scenarios to illustrate the truisms I’d written to compare alpine skiing to life. Along with ski bunnies, we added foxes, birds, and even a rare lynx. In the end, Patty completed 38 illustrations for “Laid-Back Skier.” Each is adorable and expertly rendered with expressive faces, dimensional shadows, and creative coloring. Here at Friday Jones Publishing, we all have our favorite illustration by Patty. The cumulative effect of the illustrations plus all the other elements of design and the truisms in “Laid-Back Skier” should bring a smile to reader’s faces – even if they’ve never ever been on skis. Which is the case with Patty Leidy, making her illustrations even more impressive. Wag your tale, Patty Leidy! And thank you Jesse and Josie for dragging me into Facebook. I’m red-in-the-face about my initial resistance.